Furthering India's 'Act East Policy', India and South Korea are engaging to enhance trade and investment and take forward the "Special Strategic Partnership" with the visit of South Korean President Moon Jae-in to India. 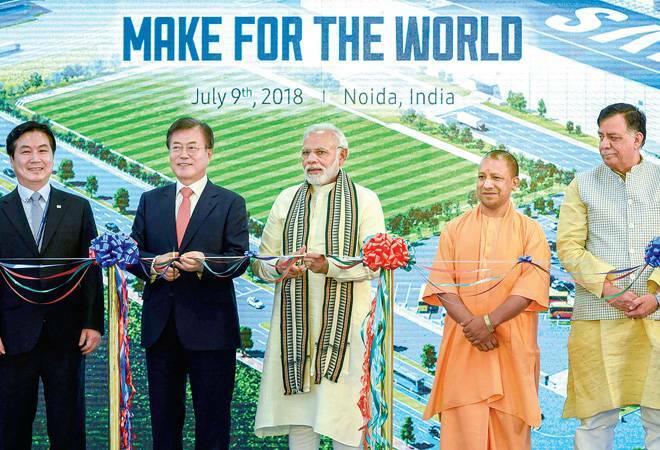 On Monday, both leaders inaugurated a 35-acre Samsung Electronics expanded facility in Noida Sector 81, which is touted to be the world's largest mobile phone production unit in terms of a number of devices rolled out every month. The company is currently making 67 million smartphones in India and with the new plant being functional, it is expected to manufacture nearly 120 million mobile phones. Samsung has two manufacturing plants - in Noida and in Sriperumbudur, Tamil Nadu - five R&D centres, and one design centre in Noida, employing over 70,000 people and expanding its network to over 1.5 lakh retail outlets. Apart from mobile handsets, the expansion of the current facility will double Samsung's production capacity of consumer electronics like refrigerators and flat-panel televisions, further consolidating the company's leadership in these segments. While this is a huge investment venture coming in from South Korea, it will also be generating a lot of jobs for the youth of this country; an area that has been a sore point for the Modi administration. Speaking at the Samsung facility, Prime Minister Modi said, "In the last four years, the number of factories has increased from 2 to 120, out of which more than 50 are in Noida. Over 4 lakh youth get direct employment." He travelled to Noida with President Moon in the metro showcasing India's growing infrastructure and the potential for further cooperation on that front. July 10 is when the official engagements will take place between India and South Korea with ceremonial reception at Rashtarapati Bhavan followed by bilateral talks and signing of agreements and a round-table with the CEOs. This visit presents India and the Republic of Korea (RoK) to converge their foreign policy vision about their respective regions. Speaking exclusively to India Today ahead of the visit, the Deputy Foreign Minister of South Korea, Ena Park said that India and South Korea will discuss a host of issues which would include military cooperation as well. "Our partnership with India is comprehensive. They will link Modi's 'Act East policy' and President Moon's 'New Southern Policy' to create a momentum in the bilateral relations," said Park. There are various agreements and Memoranda of Understanding (MoU) that would be signed during this visit. India and RoK would sign an MoU for the construction of the Queen Hu memorial park in Ayodhya, a historical connect that brings scores of South Koreans to Ayodhya every year. According to legend, queen Hur Hwang-ok, also known as Princess Suriratna, princess of Ayodhya, travelled to South Korea in 48 AD and married King Kim Suro of Karak Clan. The other MoU and agreements include one on 'trade remedies' (to resolve trade disputes by forming a cooperation committee); cultural exchange program (2018-2022); document on ICT and Communications; cooperation between SMEs (Small and Medium Enterprises) to share best practices to improve competitiveness in global markets; there will also be an agreement on road and transport highway where India will seek technical expertise and knowhow from RoK. Focusing on enhancing ties to create space for Korean investment India has set up a separate desk to deal with Korean specific investments.